L K Adavani is a toughie. I know, I could have added a ‘ji’ to his name, as the mainstream media does, but I cannot. The reason is simple. Whenever I think of him, what come to my mind is all those trails of blood that his ‘yatras’ have left behind. Actually, for the sake of political correctness and my belief in engaging even the enemies in a dialogue, once I tried referring to him like that. The consequences were heart wrenching. One, it made me queasy and second, I lost two friends. That was a lesson to remember. Trying to be politically correct maybe prudent but not when it comes to dealing with those whose histories are written with blood, others’ blood of course. 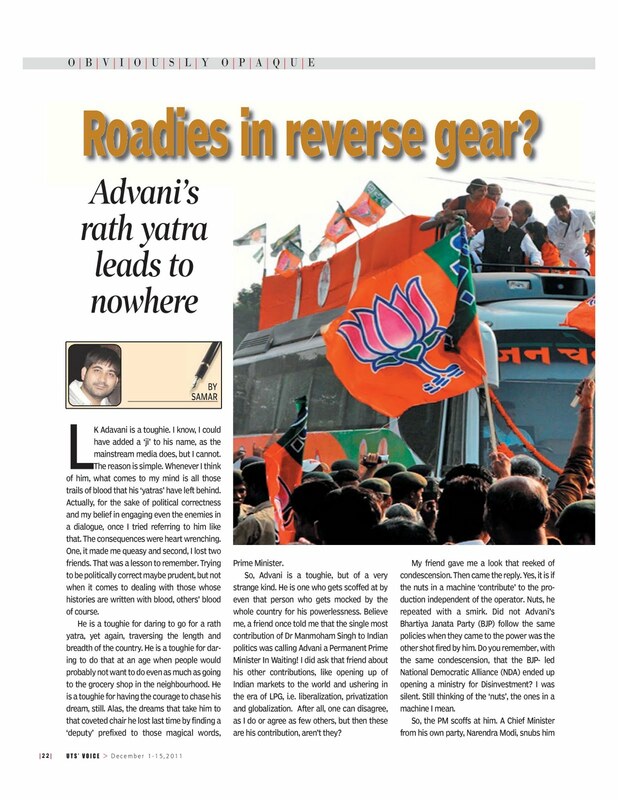 He is a toughie for daring to go for a rath yatra, yet again, traversing the length and breadth of the country. He is a toughie for daring to do that at an age when people would probably not want to do even as much as going to the grocery shop in the neighbourhood. He is a toughie for having the courage to chase his dream, still. Alas, the dreams that take him to that coveted chair he lost last time by finding a ‘deputy’ prefixed to those magical words, Prime Minister. So, Advani is a toughie, but of a very strange kind. He is one who gets scoffed at by even that person who gets mocked by the whole country for his powerlessness. Believe me, a friend once told me that the single most contribution of Dr Manmoham Singh to Indian politics was calling Advani a PERMANENT PRIME MINISTER IN WAITING! I did ask that friend about his other contributions, like opening up of Indian markets to the world and ushering in the era of LPG, i.e. liberalization, privatization and globalization. After all, one can disagree, as I do or agree as few others, but then these are his contribution, aren’t they? My friend gave me a look that reeked of condescension. Then came the reply. Yes, it is if the nuts in a machine ‘contribute’ to the production independent of the operator. Nuts, he repeated with a smirk. Did not Advani’s Bhartiya Janata Party(BJP) follow the same policies when they came to the power was the other shot fired by him. Do you remember, with the same condescension, that the BJP led National Democratic Alliance(NDA) ended up opening a ministry for DISINVESTMENT? I was silent. Still thinking of the ‘nuts’, the ones in a machine I mean. So, the PM scoffs at him. A Chief Minister from his own party, Narendra Modi, snubs him and chooses to skip BJP’s National Executive meeting. The reason he gives is insult added to injury. He could not attend the meet for Navaratras he said. Advani could not have challenged the validity of the reason for sure. Being someone who invoked Lord Rama for all his personal quests did not leave any scope for that, did it? Further, that could have infuriated the matri-shakti, or the mother power, for even Lord Rama worships Goddess Durga. Advani did have an escape route though. He could have used the excuse for rubbishing all those ‘pseudo-secular’ critiques that label his party as a misogynist one. The maverick leader he is, he could have used this as a decisive proof of the feminist credentials of his party, even if that of a subversive kind. I don’t know why he did not. Maybe he was scared of all the flak Sushma Swaraj, another stalwart of her party, received in 2004 after NDA’s shock defeat in 2004. Her vow to live as a widow if Sonia Gandhi was appointed the Prime Minister was condemned for being misogynist by the women (and of course the men who have become a little civilized unlike her fellows) left, right and center. Advani, I am sure, must have drawn his conclusions then and there. If Sushma could not get away with this I should never ever even try, he must have thought. He must have reminded himself that his specialization lays in playing with fire. He has championed the art of stoking it and running away, ahead to be more precise as the fire always trailed the raths, or the chariots, he rode. For someone with a forte in playing with fire must not dabble in the dangerous domain of feminist discourse, he must have told himself before backing off. Only a toughie can take such tough decisions, isn’t it? Interestingly, Modi’s snub was not the only one he received, even if it was the most visible one. There were many others, most of them his own protégés who were smirking at his ambitions of becoming Prime Minister of India one day, some day. They knew that it was he and his rath yatras which has brought the party to the power, but they were well aware of the political realities of their country as well. They knew that the toughie was not smarted by that soft-spoken leader from the cow-belt. They were doubly assured that it was the toughie who has trumped himself. The pretensions of being tough, more so on a particular community, could be anything but a wise political move in a country like ours. Aren’t we a country defined more by the fault lines that run beneath the slogan of unity in diversity? The road to power in this country has always gone through bridging the gaps and not by building up barricades. The toughie has committed that blunder. 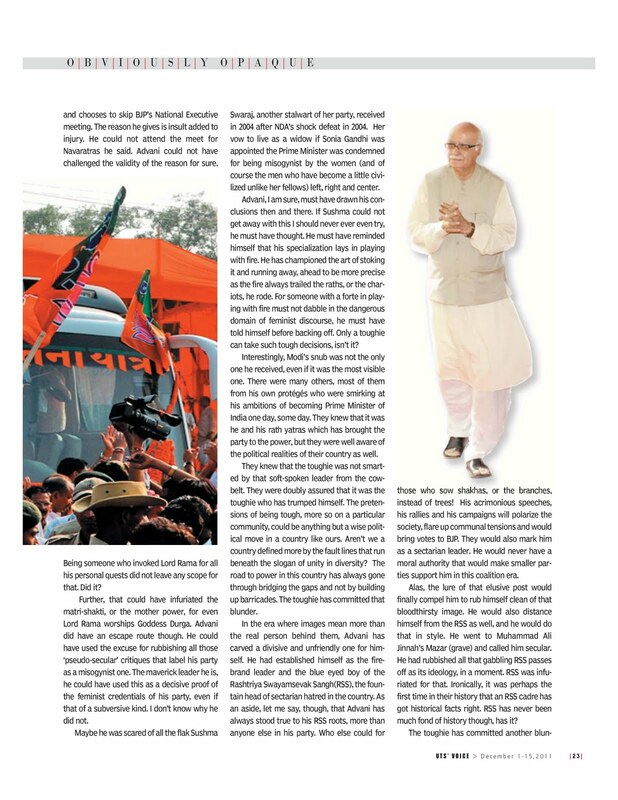 In the era where images mean more than the real person behind them, Advani has carved a divisive and unfriendly one for himself. He had established himself as the fire-brand leader and the blue eyed boy of the Rashtriya Swayamsevak Sangh(RSS), the fountain head of sectarian hatred in the country. As an aside, let me say, though, that Advani has always stood true to his RSS roots, more than anyone else in his party. Who else could for those who sow shakhas, or the branches, instead of trees! His acrimonious speeches, his rallies and his campaigns will polarize the society, flare up communal tensions and would bring votes to BJP. They would also mark him as a sectarian leader. He would never have a moral authority that would make smaller parties support him in this coalition era. Alas, the lure of that elusive post would finally compel him to rub himself clean of that bloodthirsty image. He would also distance himself from the RSS as well, and he would do that in style. He went to Muhammad Ali Jinnah’s Mazar(grave) and called him secular. He had rubbished all that gabbling RSS passes off as its ideology, in a moment. RSS was infuriated for that. Ironically, it was perhaps the first time in their history that an RSS cadre has got historical facts right. RSS has never been much fond of history though, has it? The toughie has committed another blunder. The second rung leadership has sniffed blood. They knew that this street smart chap can hold his grounds but is doomed. They knew that the post has been declared vacant. 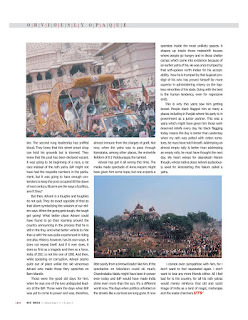 It was going to be beginning of a race, a rat race instead of the rathyatra. BJP might not have had the requisite numbers in the parliament, but it was going to have enough contenders to keep the post occupied till the dawn of next century. Bizarre are the ways of politics, aren’t they? But then, Advani is a toughie and toughies do not quit. They do exact opposite of that as that idiom symbolizing the wisdom of our elders says. When the goings get tough, the toughs get going! What better place Advani could have found to go than roaming around the country announcing in the process that he is still in the fray. And what better vehicle to ride than a rath? He was quite experienced in riding one also. History, however, has its own ways. It does not repeat itself, and if it ever does, it does so first as a tragedy and then as a farce. India of 2011 is not the one of 1992. And then, while speaking on corruption, Advani seems quite out of place unlike the old venomous Advani who made those fiery speeches on Ram Mandir. Those were the good old days for him, when he was one of the two undisputed leaders of the BJP. Those were the days when BJP was yet to come to power and was, therefore, almost immune from the charges of graft. Not now, when the yatra was to pass through Karnataka, among other places, the erstwhile fiefdom of B S Yeddyurappa the tainted. Advani has got it all wrong this time. The media made spectacle of Anna Hazare might have given him some hope but one expects a little sanity from a shrewd leader like him. If the spectacles on television could do much, Chandrababu Naidu might have been in power even today and BJP would have made India shine even more than the sun. It’s a different world now. The days when politics unfolded on the streets like a carnival are long gone. It now operates inside the most unlikely spaces. It shapes up inside those makeshift houses where people go hungry and in those shelter camps which came into existence because of an earlier yatra of his. He was once trumped by that soft-spoken north Indian for his acceptability. Now he is trumped by that Gujarati protégé of his who has proved himself far more superior in administering misery on the hapless minorities of his state. Going with the best is the human tendency, even for regressive ends. This is why this yatra saw him getting booed. People black flagged him at many a places including in Punjab where his party is in government as a junior partner. 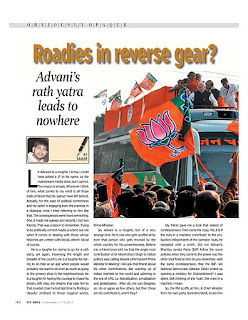 This was a yatra which might have given him those well-deserved reliefs every day. No black flagging today means the day is better than yesterday when my rath was pelted with rotten tomatoes he must have told himself. Addressing an almost empty rally is better than addressing an empty rally he must have thought the next day. My heart weeps for Jaiprakash Narain though, whose native place Advani audaciously used for kickstarting this failure called a yatra. I cannot even sympathise with him, for I don’t want to feel nauseated again. I don’t want to lose any more friends either. All I feel bad for is the country, for all his rathyatras would merely reinforce that old and racist image of India as a land of magic, maharajas and the snake charmers.